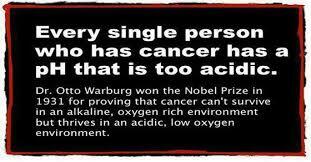 Alkaline balance is essential for our health. Our immunological, enzymatic, and repair mechanisms all function their best in an alkaline environment. The human body has three ways of regulating blood pH. Carbon dioxide is mildly acidic so its levels can be controlled by changes in your breathing rate. For example, when we exercise we produce lactic acid and carbon dioxide. Lactic acid is acidic, and the exhalation of carbon dioxide excretes acids. The kidneys also can excrete excess acid during urination. Finally, the blood is filled with special chemical mixes known as buffers, which work by resisting any sudden changes in pH. There are numerous chemical reactions required for life that can only occur within a very specific pH range, so the body has to keep pH within that range. An acidic pH level inside the human body is a common and likely contributing factor to all degenerative and autoimmune diseases. An acidic environment has many side effects on cell metabolism, affecting energy levels, accumulation of fluid and edema, and an increase in free radical production. Living with an acidic pH level can cause diabetes, cancer, obesity, migraines, osteoporosis, arthritis, gout, cataracts, stroke, morning sickness, and allergies. Everything we consume affects our pH level, either positively, or negatively. Vegetables and fruits are essentially alkaline, whereas meat and dairy products are mostly acidic. However, we must include both types of food in our diet to balance the pH level of our body. If we avoid refined or processed food, we will help prevent a possible acidic spike in our body. You can test your pH with inexpensive pH strips that you can buy online or in health food stores. Most health experts believe testing your urine is a little more accurate of total body pH. This should be done first thing in the morning. Although you can do this in the morning or in the evening, the urine in the morning usually has an acidic level. The reason for this is because, during the night, our body clears up the acids by storing them in the urine. Another more accurate and inexpensive way to check your body’s pH level is using pH strips and a color chart. In this way, you will precisely determine your pH level, and keep a regular update. First thing in the morning, gently warm a glass of quality water. Then squeeze the juice from half of an organic lemon into the warmed water and mix in 1/2 teaspoon of baking soda for a refreshing, alkalizing drink. Consume fresh juices with green fruits and vegetables. Add some wheat grass, barley grass, kelp, cayenne, chlorella and spirulina in your green smoothie and drink this every single day. Avoid fast foods which include refined and processed products. Order alkaline water online, purchase it from your health store or make it at your home. Instead of using commercial and highly toxic cleaning agents that can increase the acidic level in your body, use natural ones like plant proteins and diluted apple cider vinegar or essential oils. Avoid GMO plant and animal products as much as you can, and use only grass-fed organic animal products. Always use natural conditioner, shampoo, facial cream, makeup, soap, and mouthwash. Avoid commercial products loaded with toxic chemicals and synthetic additives which are dangerous to your health.